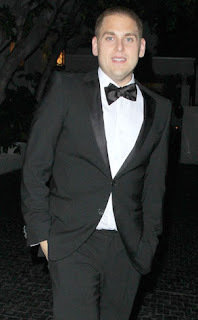 If Jonah Hill keeps losing weight his is going to be giving the twig stars like Nicole Richie a run for their money. A while back I wrote a post about his weight loss. Congrats on getting healthy, but when is enough enough? It would be one thing if all the pounds dropping unveiled a super hot dude, but this is not the case. His shtick was that he was fat and miserable. What is going to make him funny now? Wow! I wouldn't have recognised him!